Tongue twisters exist in many different languages. Here are some examples. Our Tony gave a fig because I gave him a good berry. Buta wa buta no uta o utau. The pig sings the pig’s song. Quantum materiae materietur marmota monax si marmota monax materiam possit materiarii? This last one, in Latin, is also a tongue twister in English. Here are a few more in English. Seven slick slimey snakes slowly sliding southward. What noise annoys an oyster most? A noisy noise annoys an oyster most. And finally, our favourite, and, we believe, the most difficult. Try saying this three times, quickly! Today, the 25th of January, many Scots will celebrate “Burns Night” in honour of our national Bard (poet), Robert Burns, who lived in Ayrshire and Dumfries. He was born on this day in 1759. 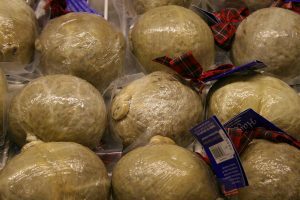 All over the world, Scots will meet to enjoy a “Burns Supper,” at which the main dish is haggis (see picture below – and nowadays vegetarian haggis is available), accompanied by a glass (or two) of whisky, bagpipe music and often dancing as well. The one of Burns’ poems that is always read out is called “Address to a Haggis.” You can find out more about Burns Night here. Address to a Haggis is quite a long poem and written in the Scots’ dialect of the time, so it is quite hard even for advanced students of English to understand. However, we’ll have a go! Here is the first verse, followed by a “translation” into modern English. Great chieftain o the puddin’-race! Great chieftain of the sausage race! As long as my arm. When you learn English, or any other language, the first thing you do is learn the alphabet. In English we have 26 letters in our alphabet, from A to Z. Do you know why this sentence is important for those who are learning to type? The answer is simple. The sentence “the quick brown fox jumps over the lazy dog” contains all 26 letters in the English alphabet and each letter is only used once! Well, we trust that, if you celebrated it, you have had a very enjoyable New Year. In our country, there are lots of traditions associated with Hogmanay, as we call the 31st of December, and the New Year. Perhaps the best known is “first-footing,” when neighbours and friends call round to each other’s houses to be the “first foot” – the first person that their neighbour sees on New Year’s Day. Traditionally, lumps of coal were brought, along with (as you might expect in Scotland) a bottle of whisky! However, as a major language school, we are well aware that there are many different ways of celebrating the arrival of the New Year and, of course, different countries and cultures celebrate it in different ways and at different dates. We believe that in Poland there is a legend that Pope Sylvester captured a dragon which would have eaten everyone on earth and set fire to the skies. For the Polish people, New Year’s Eve is “St Sylvester’s Eve,” when they celebrate this story that the world did not end at the end of the year. In Russia, it’s good luck to start the New Year without any debts, so people try to pay off their bills and other debts. In the last 12 seconds of the old year, Russians make secret wishes for the coming year. The Chinese New Year is, as you probably know, not at the same time as ours. Instead, they celebrate between January 21st and February 20th, depending on the Chinese calendar. Some Chinese paint their front doors red, because red symbolises good luck and happiness. They also put all knives away for 24 hours, because if someone cuts themselves that would cut the family’s good luck for the New Year. In Denmark, people like to smash plates at New Year. This is said to bring good luck for the next 12 months, so if you are in Denmark don’t be surprised to find a broken plate on your doorstep on January 1st! In Brazil, lentils are associated with money, so don’t be surprised if you see someone eating lots of lentils at New Year! outside doors and walls of homes: they are put there to protect the families inside from evil spirits. On New Year’s Day people wear new clothes made with five colours (red, white, blue, yellow and green), symbolising a new start. Finally, New Year is also a time when people make resolutions which they try to keep in the months ahead (most people break them, but that’s sometimes part of the fun!). However, no matter what country you are from, this is a time for looking forward and thinking about all the good things you can do in 2018. And if you thinking of coming to the UK to study English why not make a resolution to come to Global School of English – we’d be delighted to see you and it could be one of the best decisions you’ve ever made!